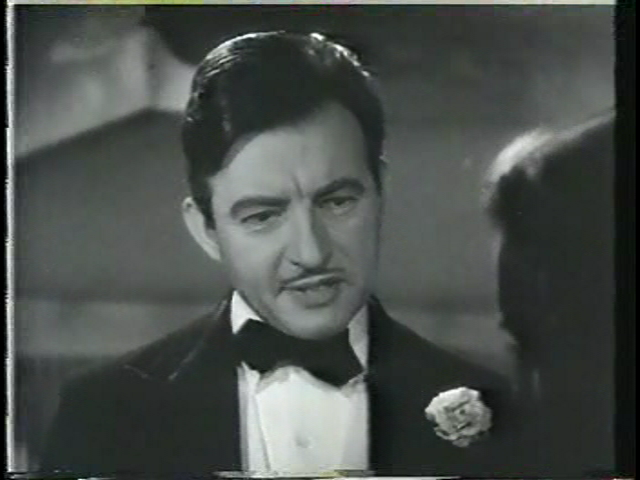 A successful lawyer (Claude Rains) engaged to an icy blonde (Whitney Bourne) accidentally shoots his mistress (Margo), then constructs an elaborate series of alibis to cover up his crime. This little-seen psychological thriller establishes itself as a must-see gem from its fantastical opening sequence, in which we witness the three dark-haired “Furies” of Greek myth emerging full-form from droplets of blood, and immediately wreaking gleeful havoc upon unsuspecting mortals. When this mind-bending montage comes to a close and the camera settles upon the story’s all-too-human protagonist (Rains), the effect is somewhat unsettling — yet Ben Hecht and Charles MacArthur’s clever, witty screenplay immediately draws us in to Rains’ romantic dilemma. While the story remains firmly grounded in “real life” from this moment on (with only occasional nods to the supernatural), the point has been well established that Rains’ cocky, womanizing lawyer will be made to pay for his arrogance, and in a suitably dramatic fashion. Rains is excellent in the lead role, managing to sustain our interest despite his character’s decidedly unsavory actions and demeanor. Equally impressive is 17-year-old Margo (castanet-clicking “Clo-Clo” in Val Lewton’s The Leopard Man) in her screen debut as the object of Rains’ lustful affections — while we desperately want to shake some sense into her (how can she be in love with such a cad?! ), she engages our genuine sympathies as well. 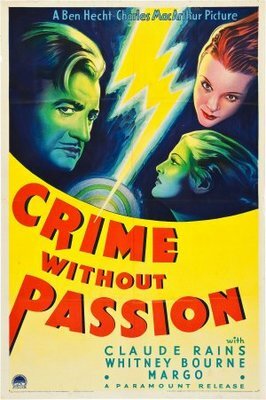 Wrapping up within a neat 70 minutes, Crime Without Passion tells its fall-from-grace narrative quickly and succinctly, and is well worth the enjoyable ride. Yes, as an all around “good show”. Listed as a Cult Movie in the back of Peary’s book. First viewing. A must. Although not a perfect film, it’s damn close. What we have here – as mentioned – is the phenomenal opening sequence (with a bookend closing), an intriguing performance by Margo, and a standout (again) turn by Rains. Many actors come into their own as they progress in films. Not Rains. He made his stamp clear straight-out from ‘The Invisible Man’ – with mostly his voice! Reporter: The grand jury’s going to read this, Mr. Gentry. Rains: Oh, in that case, please add that I consider that – supreme body – a group of illiterate, ineffectual nincompoops, with the combined courage and mentality of an amoeba. Once Rains’ conscience enters, I must say I find the proceedings a little slow. Still, momentum holds. And there’s a terrific bit of suspense built around a lost telegram. My second fave visual, after the astounding Furies, is the image of a shocked Margo against the backdrop of a maniacally grinning cartoon face. Question: Is the character of Buster Malloy supposed to be Fanny Brice?